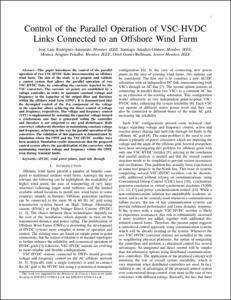 This paper introduces the control of the parallel operation of two VSC-HVDC links interconnecting an offshore wind farm. The aim of the study is to propose and validate a control system that allows the parallel operation of two VSC-HVDC links by controlling the currents injected by the VSC converters. The currents set points are established by a voltage controller in order to maintain constant voltage and frequency in the capacitor of the output filter and therefore within the offshore wind farm (OWF). It is demonstrated that the decoupled control of the d-q component of the voltage at the capacitor allows achieving the direct control of voltage and frequency, respectively. The voltage and frequency control (VFC) is implemented by orienting the capacitor voltage toward a synchronous axis that is generated within the controller and therefore is not subjected to any grid disturbance. Both converters collaborate therefore in maintaining constant voltage and frequency, achieving in this way the parallel operation of the converters. The validation of this approach is demonstrated by simulation where the OWF and the VSC-HVDC rectifier have been modeled. Simulation results demonstrate that the proposed control system allows the parallelization of the converters while maintaining constant voltage and frequency within the OWF, even during transient faults. © 2019 IEEE. Personal use of this material is permitted. Permission from IEEE must be obtained for all other uses, in any current or future media, including reprinting/republishing this material for advertising or promotional purposes, creating new collective works, for resale or redistribution to servers or lists, or reuse of any copyrighted component of this work in other works. Rodríguez, J. L. [et al.]. Control of the parallel operation of VSC-HVDC links connected to an offshore wind farm. "IEEE transactions on power delivery", Febrer 2019, vol. 34, núm. 1, p. 32-41.